WASHINGTON: US Secretary of State Hillary Clinton on Friday defended her decision to publicly air America’s grievances against Pakistan, saying that she had not come to the country for ‘happy talk’ alone. 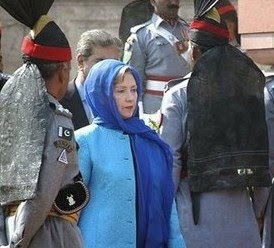 Her three-day trip, which ended on Friday, was aimed at getting frank, open discussions going about the fight against terrorism — and that includes presenting US concerns, Mrs Clinton told CNN. She stunned Pakistanis on Thursday when she told a gathering in Lahore that she did not trust Pakistan’s version of its engagement with Al Qaeda. ‘Al Qaeda has had safe haven in Pakistan since 2002. I find it hard to believe that nobody in your government knows where they are and couldn’t get them if they really wanted to,’ she said. In times of unimaginable tragedy, it is hard to judge outpourings of grief. The mind is freckled by floods of angry emotion. After having said this, I still feel disappointed that right after the International Islamic University (IIU) bombings one of the pictures I saw in the press was of a demonstration by the boys of the university upholding banners that were against the Kerry-Lugar bill. It seemed to me the significance of what had happened to these hapless students hadn't yet dawned on them. The International Islamic University has absolutely nothing to do with the bill, and in any case the Taliban didn't bomb the university because they were convinced that the IIU had drafted it for John Kerry. Even at that time, in the aftermath of a senseless act it was difficult to acknowledge for people that the Taliban were utterly nihilistic in their aims. Foreign ministers of China, Russia and India, holding their 9th meeting in Bangalore in India, have jointly urged the international community not to let the focus slip from their mission in Afghanistan. They also jointly condemned “terrorism in all its forms and manifestations and reiterated that there could be no justification for any act of terrorism anywhere”. The three countries spoke of “the commitment of restoring peace and stability and building a democratic, pluralistic and prosperous Afghanistan”. In the joint statement, China joined the other two countries in condemning the “recent terror attack on the Indian embassy in Kabul”. The context of the meeting was also found in the Shanghai Cooperation Organisation (SCO) which was “steadily becoming an important factor of emerging architecture of security, economy, culture, people-to-people contacts and cooperation in Asia”. Let me start this piece with a declaration of faith. As an Indian who knows the neighbouring country, I affirm that Pakistan has enough courage, commonsense and diligence in its people to survive the tough challenge it faces. I follow this avowal with a groan. What, I ask, will be the consequences of the cruelty heaped the other day in Faisalabad on a humble young woman and a humble young man for their crime of seeking the shade of a campus tree for a short conversation away from their hard lives of poorly compensated toil? The uniformed security guard who reportedly shaved those innocent heads, and thereby proved his manliness to himself, was an unknowing accomplice of the Taliban, and campus officials who refuse to punish the security guard are, whether or not they know it, the Taliban’s allies. Dr. Tariq Rehman, Director National Institute of Pakistan Studies, Quaid-e-Azam University Islamabad chaired the seminar while Mr. Zafarullah Khan, Executive Director Centre for Civic Education, Islamabad was the key speaker and discussant. Other speakers included Mr. Taufeeq Asif Advocate, President Rawalpindi Bar Association, Mr. Afzal Khan, South Asia Free Media Association (SAFMA), Mr. Amir Zia, Director News at Samaa TV, Islamabad, and Mr. Javed Siddique, Resident Editor Daily Nawa-i-Waqt, Islamabad. In recent years, Pakistan has endured tremendous challenges—including militant attacks, high-profile political assassination, suicide bombings, prolonged political instability, and deteriorating law and order—but is the situation as dire as some claim it to be? Join experts for a discussion on these and other pertinent issues. 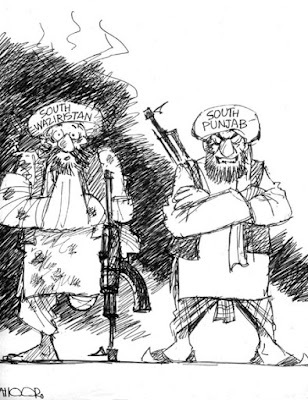 RAWALPINDI, PAKISTAN Until a few months ago, Pakistani officials often used the term "miscreants" when they described the Taliban fighters operating from the western tribal areas. 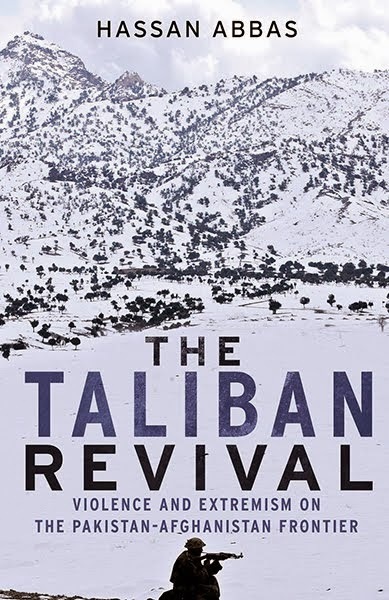 This moniker conveyed the sense that the Taliban was a nuisance -- a ragtag band of fanatics and gangsters who could be placated with peace deals -- rather than a mortal threat to the nation. As a wave of militant attacks hits Pakistan, tensions between the army and the civilian government have hit a new high, despite promises by the military establishment that it would no longer intervene in politics. Guest columnist Ahmed Rashid has this assessment. The renewed tension comes as feverish speculation has gripped the country about the army's intentions, after it forced the government to backtrack on a US bill which provides Pakistan with millions of dollars as long as it pledges to eradicate Taliban and al-Qaeda militancy. 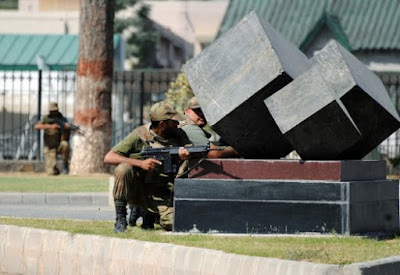 At least nine Taliban suicide attacks have hit Pakistan's security forces in the days from 5 October - including a devastating and embarrassing siege inside the army's General Headquarters (GHQ) in Rawalpindi that claimed 22 lives, and three attacks on a single day in Lahore. Over 150 people have been killed and several hundreds injured. Is a Fair Election in Afghanistan Possible? - Yes, Why Not? President Hamid Karzai’s acceptance of a runoff election in Afghanistan may be a first step to creating a credible Afghan government, but much uncertainty remains. Abdullah Abdullah, the chief rival to Mr. Karzai, said Wednesday he was preparing for a second ballot, set for Nov. 7, but he left open the possibility to joining a coalition with Mr. Karzai that would make a new vote unnecessary. Is there a way to reduce fraud when nearly a quarter of the ballots in the August vote was thrown out by international auditors? What measures should be taken in the brief time before the second election? Can its outcome be trusted? LADDAH: Troops and militants were locked in fierce clashes in several Mehsud areas of South Waziristan on Tuesday and the army said that 12 Taliban fighters had been killed since Monday night. Four security personnel lost their lives. Troops trying to dislodge militants from their positions and take control of hilltops and strategic locations were facing stiff resistance. According to an official of the political administration, the four security personnel, an army major among them, were killed in clashes in Toor Ghundai. Four soldiers were injured in Sherwangi. Heavy clashes were reported from Nawazkot and Makin areas. The official said the Taliban had suffered heavy casualties in Toor Ghundai, but he was not sure about the number of casualties. Sources said that militants had repulsed an attack in Kotkai area. KABUL, Afghanistan — President Hamid Karzai’s concession of the need for a runoff election in Afghanistan appears to have prevented his country from slipping into paralysis, but has created a new landscape of risks and uncertainty. Mr. Karzai’s concession was a critical first step toward creating a credible Afghan government, coming after heavy pressure from European and American officials, including veiled threats that his actions could affect pending decisions about troops levels, according to one American official who spoke on condition of anonymity because of the delicacy of the matter. 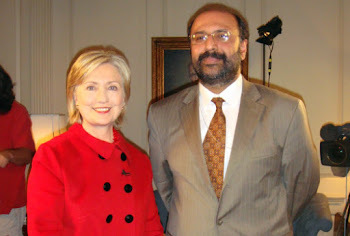 On October 14, 2009, Simon Shercliff, First Secretary at the British Embassy in Washington with responsibility for Afghanistan and Pakistan, and Hassan Abbas, a Senior Adviser to Harvard Kennedy School's Belfer Center for Science and International Affairs and a former Pakistani government official, met to discuss the complexities of Pakistan's relationship with its neighbors, and to explore the UK Government's commitment to Pakistan and the region at large. Shercliff, noting the "strategic nexis" between Afghanistan, Pakistan, and India, began the conversation affirming the British Government's interest in seeing a "long term strategic discussion" between India and Pakistan, ultimately leading to a "warming of the relationship." PAKISTAN REELS from almost daily bombings, and its cities, Lahore, Rawalpindi, Peshawar, and Islamabad are cited in news reports as once were Ramadi, Najaf, Samarra, and Baghdad when Iraq was on the boil. The Pakistani army is now engaged in the frontier tribal areas as never before, and its intelligence officers are admitting to an increasingly coordinated threat from the Taliban and Punjabi militants, both with links to Al Qaeda. Most worrying is the rise of Islamic militancy in the Punjabi heartland, showing that the growing insurgency cannot be limited to the Afghan frontier. Americans have been telling the Pakistanis that the real threat came from this insurgency nexus, not from Pakistan’s traditional enemy, India, and that Pakistan should wake up to the danger. Yet the bulk of Pakistan’s armed forces are still focused on the Indian border. Eight years ago, Washington's special envoy to Afghanistan, Zalmay Khalilzad, told former mujahideen leaders -- the likes of Marshal Muhammad Qasim Fahim and Abdul Rasul Sayyaf -- that they had a choice: either be part of the solution or the problem. 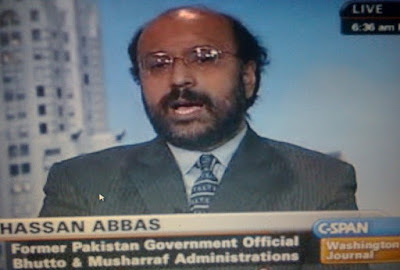 Hassan Abbas, Harvard Univ. Belfer Center for Science & Int’l Affairs, discusses concerns about Pakistan's security in the face of threats by insurgents and the Taliban, and how this affects Pakistan’s foreign policy, especially with its neighbor, Afghanistan. A Taliban victory would have devastating consequences for U.S. interests. But to avoid disaster, America must beware the Soviet Union’s mistakes -- and learn from its own three decades of failure in South Asia. The United States has two compelling interests at issue in the Afghan conflict. One is the ongoing, increasingly successful but incomplete effort to reduce the threat posed by al Qaeda and related jihadi groups, and to finally eliminate the al Qaeda leadership that carried out the Sept. 11 attacks. The second is the pursuit of a South and Central Asian region that is at least stable enough to ensure that Pakistan does not fail completely as a state or fall into the hands of Islamic extremists. Democracy in Pakistan under threat? Is Project Democracy in trouble? Is the latest kerfuffle in civil-military relations, this time over the Kerry-Lugar bill, just another manifestation of the broken, chaotic decision-making process at the institutional level from which the system will soon move on? Or is it another marker in deteriorating relations between the presidency and the army high command that are slowly edging towards the point of no return? When — if — the obituary of the Zardari presidency or government is written, it’s safe to say that the Kerry-Lugar fiasco will surely merit more than a footnote. So which is it? Are we headed for bust and the derailment of the present phase in the transition to democracy, or even the transition itself, or is this what democracy in Pakistan is set to look like for the foreseeable future, a process characterised by brinkmanship without quite slipping too close to the edge of the cliff? ISLAMABAD -- Pakistan erupted in a wave of insurgent violence Thursday when gunmen attacked three security-agency buildings in the eastern city of Lahore, killing at least 20, including six attackers, and a suicide bomber killed at least six people at a police station in the country's northwest, according to officials. Police suspected that as many as 50 militants were involved in the attack on the Elite Force police center in Lahore. Major General Shafqat Ahmed, the general officer in charge of Lahore, said the center had been cleared of militants and five attackers were killed. He said a search operation was being carried out for the other assailants. The center provides training to the antiterrorist police force. Congress sticks a gratuitous thumb in Pakistan's eye. This is said to be the age of "smart power," when the U.S. uses diplomacy and foreign aid, not force of arms, to advance its interests. This must not take into account the room-temperature diplomatic IQs on Capitol Hill. At the request of President Obama, Congress voted last month to triple American aid to Pakistan to $7.5 billion over five years. The Kerry-Lugar bill signals America's commitment to Pakistan, which we want to help us defeat the Taliban and al Qaeda along the Afghanistan-Pakistan border. This should have been an easy diplomatic win—until some of the 435 Secretaries of State in the House decided to make their own Pakistan policy. WASHINGTON: The requirement for an effective civilian control over promotions and strategic planning in the Pakistani military is not mentioned in a new joint explanatory statement of the US Congress issued on Wednesday. ‘There is no intent to, and nothing in this act in any way suggests that there should be, any US role in micromanaging internal Pakistani affairs, including the promotion of Pakistani military officers or the internal operations of the Pakistani military,’ said an explanatory note attached to the Enhanced Partnership with Pakistan Act of 2009. The explanatory note also dilutes the requirement that needed Pakistan to interrogate any Pakistani national involved in nuclear proliferation and to allow US officials access to such a person. It's been a particularly violent week in Pakistan. A string of bombings has rocked several communities, killing dozens and injuring many more. The recent spate of attacks raises questions about the ability of the Pakistani government to control militants in the country's largely lawless northern region. Michele Norris speaks with Hassan Abbas, senior adviser to the Belfer Center at Harvard's Kennedy School and a fellow at the Asia Society. Before Pakistan could start recovering from a suicide bombing at a U.N. office in Islamabad and a massive bomb blast in a Peshawar market last week, the brazen October 10 attack targeting Pakistan's most secure military complex -- Army Headquarters (GHQ) in Rawalpindi, just a few miles from the capital of Islamabad -- jolted it further. This latest attack dragged on for 18 hours as around 40 officials were held hostage by terrorists in a building that belongs to a very important military department. During initial gun battle, the Army lost a brigadier and a lieutenant colonel. This episode concluded with the arrest of the commander of the operation Aqeel, alias Dr. Usman, and the killing of his some seven associates who wore army fatigues and had coordinated their attack on GHQ from at least two directions. RAWALPINDI, Pakistan — Pakistani commandos raided a building inside army headquarters early Sunday and freed 22 people held hostage for more than 18 hours by Islamist militants, a military spokesman said. Three captives and four militants were killed in the operation. Explosions and gunshots rang out as commandos moved into a building in the complex just before dawn, while a helicopter hovered in the sky. Three ambulances were seen driving out of the heavily fortified base close to the capital, Islamabad. The Kerry-Lugar Bill is about giving Pakistan money. For the Americans, the legislation may have evolved into becoming an instrument of democratisation, an instrument of imperialism, or an instrument of development--and it may even be possible that it is all three, or none of the three. But for Pakistan, the bill has always been about one thing: money. The debate and discourse it is stimulating today is peripheral to that central issue, and it conceals the realities of the incentives that drive the Pakistani elite's behaviour. Military, feudal or capitalist, the elite have always had a serious thing for other people's money. 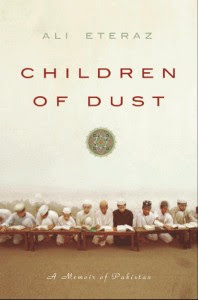 Children of Dust is a probing and vital memoir of growing up male, Pakistani, and Muslim as Ali Eteraz shares his experiences at rural Pakistani madrassas, his conflicts as a Muslim activist in the U.S., and his engagement with the modern Middle East as an adult in a post-9/11 world. As a lawyer, columnist, and writer, Eteraz has worked for the advancement of legislative and legal reform in the Muslim World. He is currently a contributor to The Guardian, True/Slant, and Dawn, Pakistan’s largest and oldest English language daily. His articles have appeared in Dissent, Foreign Policy, Open Democracy, and Alternet, among others, and have been linked by hundreds of blogs, including NYTimes. may be most closely associated with the Middle East, where it emerged in Arabia in the seventh century, but today the region is home to only one in five of the world's Muslims, according to a study of the religion's global distribution.